If you have been to Hungary and miss it, or even if you haven’t, Hungaricum is a nice place for wine and spices. All goods are originally from Hungary. The wine and spices shelves take up the biggest part of the shop, but you can find some cheese and sausages too. All these products are probably nothing special in Hungary, but in Latvia you wouldn’t find most of them in any other shop. Firstly it was just a shop, but now I sometimes go there for a quick lunch. Every day they offer tasty Hungarian goulash soup or some other soup according to Hungarian recipes. Sometimes there is another offer – like stuffed peppers. Ask for bread, they make it themselves. Do not hesitate to ask for the recipe and advice on how to make Hungarian dishes, the staff is very helpful. 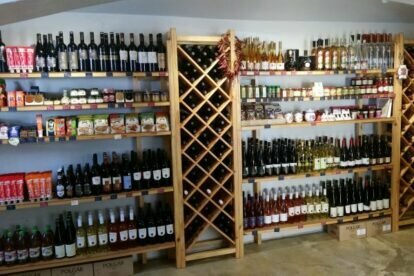 If you are lucky to meet the owner of shop (he is from Hungary too 😉 ) he can tell you a lot about each product and all the wine. Where they come from, which region etc. The owners definitely love to cook. While eating my goulash I usually read a cooking magazine, which are displayed there for visitors. This is different from all these “Yellow press” magazines in other lunch places.